Side Story: You are excused to skip this and jump to the main story if you are pressed with time. My 5y/o boy, who's traits and personality are quite similar with mine, loves surprises. Sometimes when I come home from work, he'd greet me at the door saying, "Close your eyes, mommy! I have a surprise for you!" Of course, I always happily oblige. Whilst I close my eyes, he'd say "Not yet, not yet! ", a cue that I shouldn't peep yet until he gives me the go signal to finally open my eyes and take a look at his surprise. Oftentimes, his surprise is a drawing that makes me go awwwww and give him my sweetest hugs and kisses instantaneously. As a token of appreciation for all his sweet gestures, I also make extra effort to surprise him whenever I can. And because I am a full-time working mom, I do so on weekends. There was one weekend I surprised him with a freshly cleaned and reorganized play area and he was so thrilled, he played right away upon waking up whilst I cook his breakfast. I added the little sprinkler with cactus because G loves plants and the word B R E A K F A S T because he is also into spelling nowadays. He woke up so happy upon seeing my lovely set up. On other days, you don't even see him smiling when he wakes up because he'd claim he is still sleepy. It helped so much that The EZPZ Happy Mat came in a smiley face design and vibrant colour. Instant mood lifter for grumpy "Just-woke-up, I-don't-want-to-eat" type of kids. With it, G had a very happy mealtime experience. Achievement unlocked! 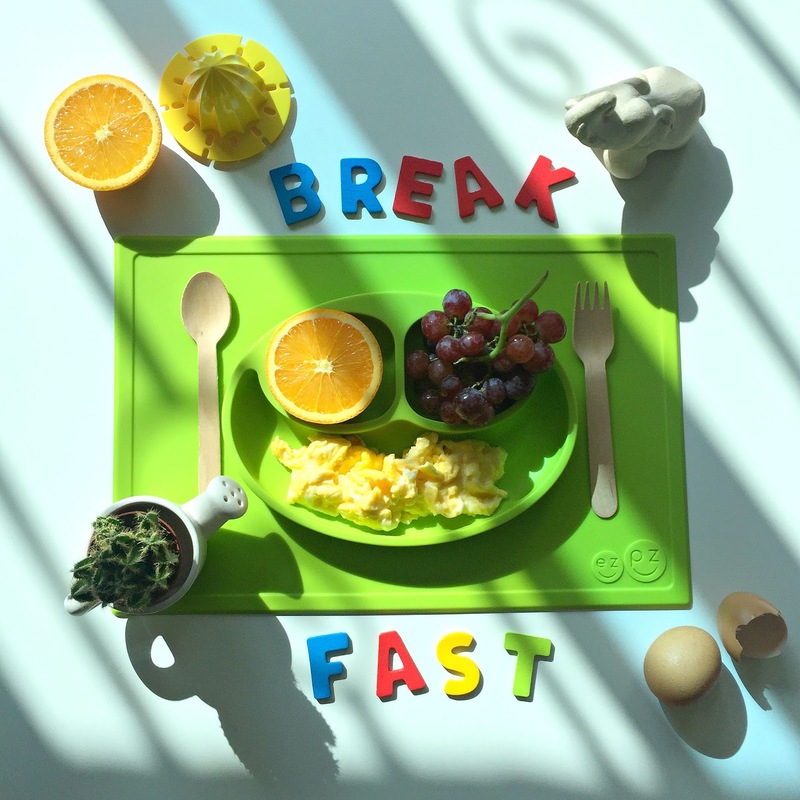 It is an all-in-one placemat + plate that captures your kids' mess which means less cleaning work for mommies! It suctions directly to the table, making it nearly impossible for tiny hands to tip over. No more accidentally spilling the food all over the table! The Happy Mat is made of 100% food grade silicone that is BPA, BPS, PVC, latex and phthalate free so you are rest assured it's really safe! It promotes self-feeding and help kids develop fine motor skills. Perfect for infants and toddlers! It is stackable up to 3-4 mats, easy to store and built to last. Do look out for the EZPZ brand name as the product is most likely sourced from another manufacturer without the logo. Other manufacturer may not be compliant with regulatory requirements. EZPZ works hard to maintain the highest and most rigorous standards for safety, non-toxic materials and quality. Now, here's the good news! In collaboration with MumsPick, we are giving away this Berry limited edition of The Happt Mat to one of our lucky readers over at Instagram! 1) Like MumsPick Facebook Page here. 2) Follow @sweetmemoirs on Instagram and leave your comment in this photo. 3) Invite your mommy friends to join the giveaway (optional). Giveaway closes on Saturday, 25th of February and winner will be drawn the following day - Sunday, the 26th. Best of luck mommies! 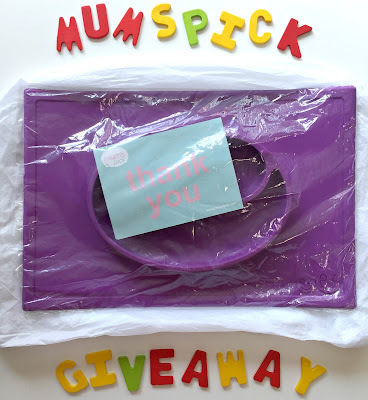 or my Instagram profile and you'll get a surprise gift from MumsPick! I will be putting up my discount code too so watch out! Quote "SweetMemoirs" and get 15% off your Happy Mat purchase. Discount code expires in two weeks so hurry and find MumsPick at the Baby Land Fair, Booth A09, happening NOW until Sunday at Suntec City! Wow that mat looks nice! And in such lovely colours! I remember using a similar mat for my kids and it was super convenient and easy to use without a mess.